"We have no objection to the sale of food derived from J.R. Simplot Company's" potatoes for human consumption, Karen McIntyre, director general of Health Canada, said in a letter sent on July 28 to the company. The three varieties of potato—the Russet Burbank, Ranger Russet and Atlantic—were approved by U.S. regulatory agencies in February. The company said the potatoes contain only potato genes and that the resistance to late blight comes from an Argentine variety of potato that naturally produced a defense. Farmers on Prince Edward Island successfully grow Russet Burbank potatoes, Cole said, but the wet climate makes late blight a problem. 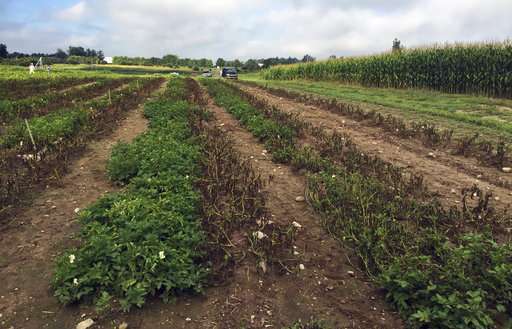 A potato with resistance to late blight could help. "There's strong interest from farmers to get that potato with that trait so they can spray less and have a better quality crop," Cole said. There is no evidence that genetically modified organisms, known as GMOs, are unsafe to eat, but changing the genetic code of foods presents an ethical issue for some. McDonald's declines to use Simplot's genetically engineered potatoes for its French fries. Simplot officials said the potatoes also have reduced bruising and black spots, enhanced storage capacity and a lower amount of a chemical that's a potential carcinogen and is created when potatoes are cooked at high temperatures. The most recent Canada and U.S. approvals apply to Simplot's second generation of Innate potatoes. The first generation didn't include protection from late blight or enhanced cold storage. The company said the potatoes have the same taste, texture and nutritional qualities as conventional potatoes. Those potatoes are now available in 40 states and 4,000 supermarkets, Cole said, with about 60 million pounds (27.2 million kilograms) sold. "We are pleased with sales in the U.S. and hope they will continue," he said. Hey-hey- a little cross-border okey-doke action to make it super easy for BigAg to drop these taters right into your food supply --with neither your know-so nor say-so. And all with EXACTLY ZERO life-cycle safety testing. This natural gene for Phytophthera resistance is much preferred to chemical fungicides, most of which have serious environmental and human health impacts.